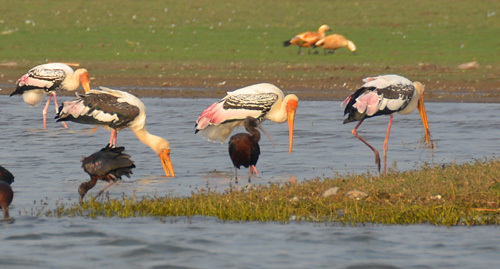 Bhigwan is a small town around 100 kms away from Pune and is also referred to as the “Bharatpur of Maharashtra”, as it becomes a hotbed of migratory birds during the winter. 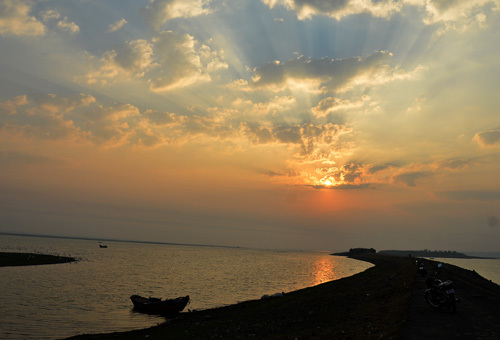 Bhigwan is at one end of the huge Yashwant Sagar reservoir, forming the backwaters of the Ujain dam. 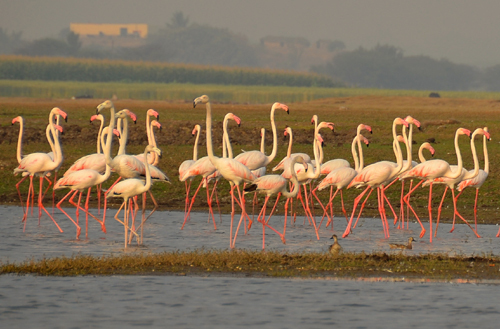 One of the main attractions during the migratory season is the arrival of the pink greater flamingos. 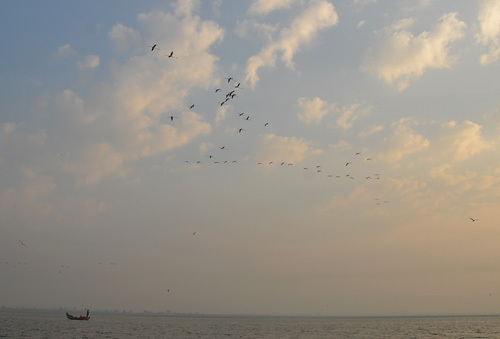 During the months of early jan – late feb, this place is thronged by bird lovers from all over Maharashtra. To reach Bhigwan, take the Solapur road and drive for around 95 kms (from Hadapsar) or use the map below to reach Bhigwan (route from Magarapatta city). 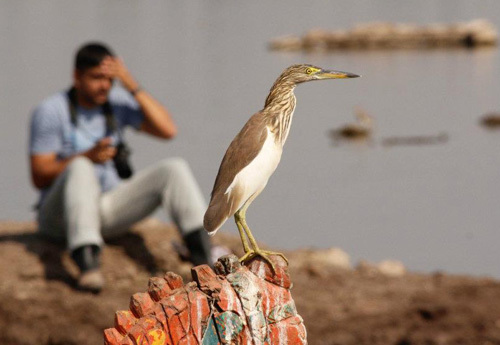 Most of the bird sightings happen around two places, Diksal and Kumbhargaon. The reservoir is dozens of kms long. Maybe, there are more (and better) locations downstream?? 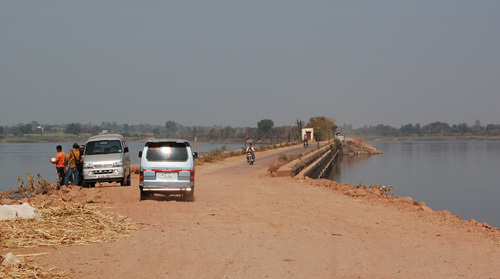 To reach the two places, do not follow the map as the roads can be misleading and the water levels depicted on the map could be very different than the current situation. If the monsoon was heavy, roads could disappear or for a bad monsoon, you would see uncharted roads appear out of the water! 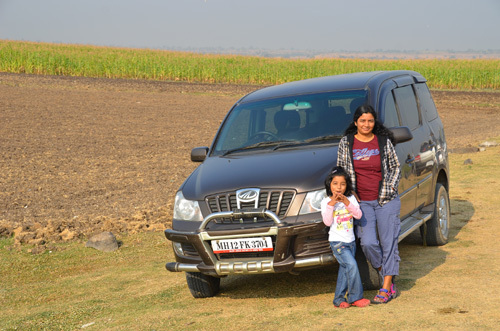 I went to Diksal last year (Jan 2012) and to Kumbhargaon this year (Feb 2013). Diksal: Once you reach Bhigwan, you have turn left to go to Diksal. The “bird watching” place i.e. the waterfront is around 5-6 kms inwards. 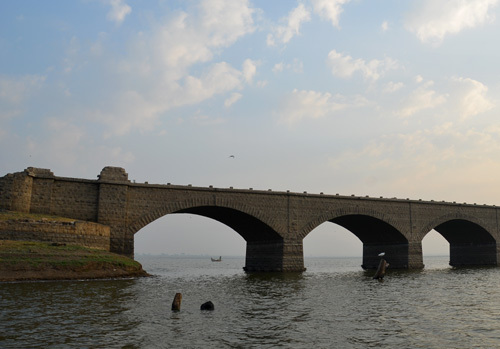 Ask for “Juna Phul” meaning “Old bridge” (photo below). This is the spot where many birds gather and also the place to rent a boat to go into the waterways. 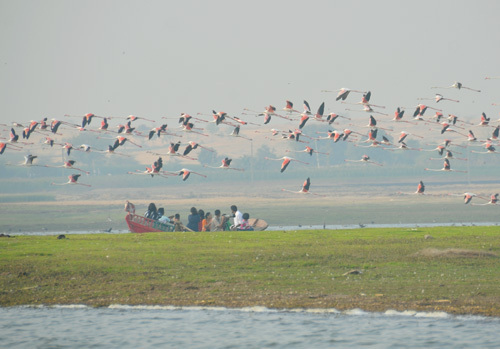 Kumbhargaon: To reach this village, you have to drive ahead of Bhigwan for around 2 kms and look for sign boards saying “kumbhargaon” or “flamingo point”. There are multiple entry points to this village and we happened to choose the one with the “kuchcha-est road”, but the Xylo managed it with ease. Plan your trip such that you are there before 7 Am. Even though it is winter, by the time it is 10 AM, it gets scorching hot and frustration starts creeping in if you have to wait in patience for the birds. 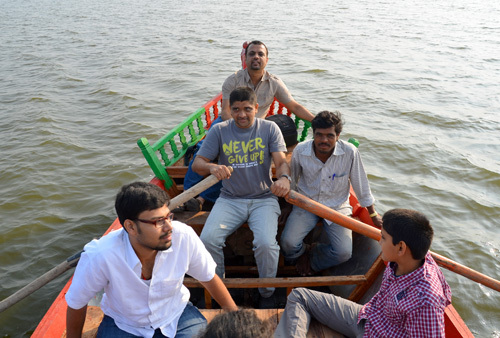 We started from Pune at 5 AM and hence, when we got into the boat, it was around 6.45 AM and it was lovely. 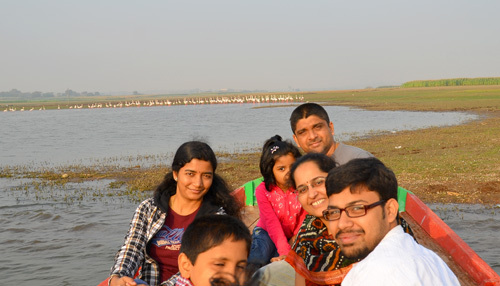 The chilly breeze with the rising sun made it a wonderful boating experience too. If you are having a point and shoot camera or planning to take photo with a mobile, be ready for a big-time inferiority complex (if you are prone to it!). 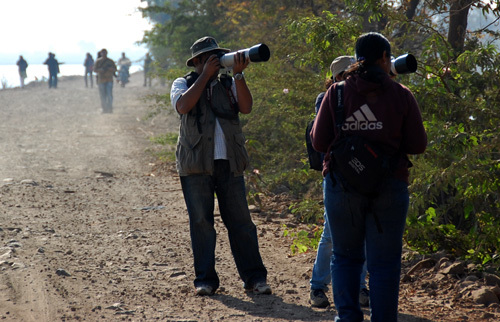 It is not uncommon to see “birders” here with lens longer and bigger than a typical walking stick. Note: My photos in this post are not so great due to various reasons including an old/unclean lens, typical touristy approach etc. When i was browsing around for photos from Bhigwan, i found a set which had amazing photos. When i looked at the EXIF data, the lens used was a 600 MM f4 and that costs 9800 USD !!! Many cars cost less! Anyway, whatever be the equipment, the photography is fun and it requires patience. 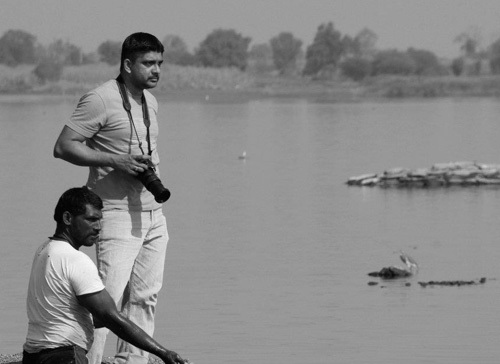 When patience runs out and when birds dont come within the zoom range, guys (my friends who came along) started using me as a prop along with the birds. 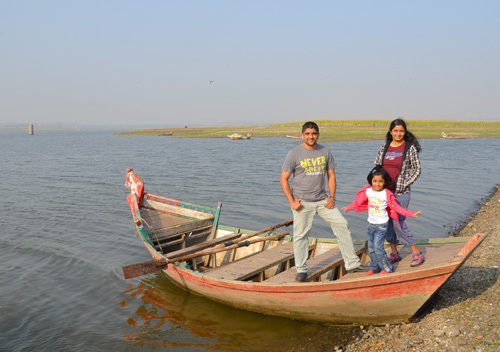 The boating part from Kumbhargaon was fun. We were approaching a group of flamingos on the other side of the bridge and suddenly all of them took off. We watched them for a couple of minutes and once they settled down on the other side of the lake, we (both the boats) turned around and the chase continued. 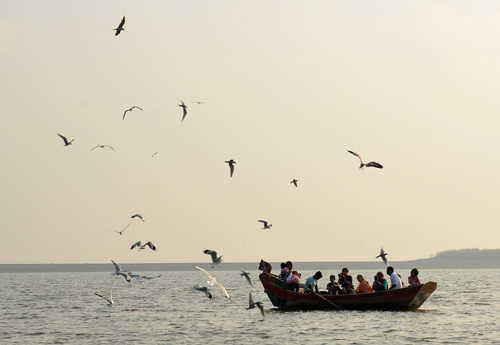 Boating costs 100 Rupees per person. 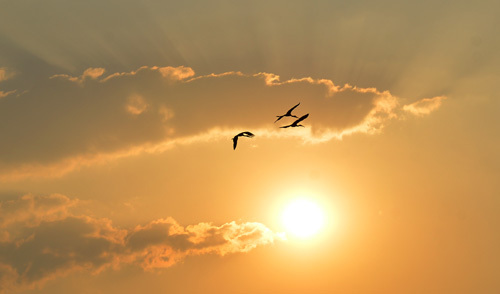 Leave alone the birds, you get more than your money’s worth in just the boating experience. 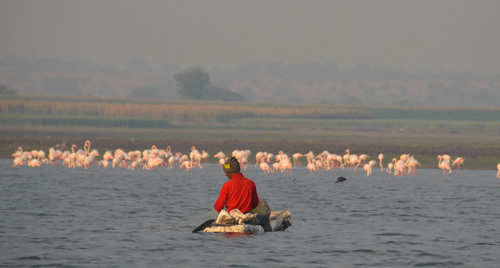 The flamingos were very wary of approaching boats. But, probably they knew to differentiate between the locals and the ooh-aah noisy tourists with bazookas. They didn’t seem to mind the fisherman coming near them (he was using thermocol sheets sticked together as a floating device). As you can see from the second photo below, we had to be at quite distance to avoid disturbing them, but good enough to the naked eye to catch the details. The other boat had a guy with walking stick lens and a bazooka tripod. They tried to get closer and closer and at one point, the entire flock just flew off. It made a good sight, from our boat! If you happen to catch a flock of flamingos landing, it is poetry in motion. 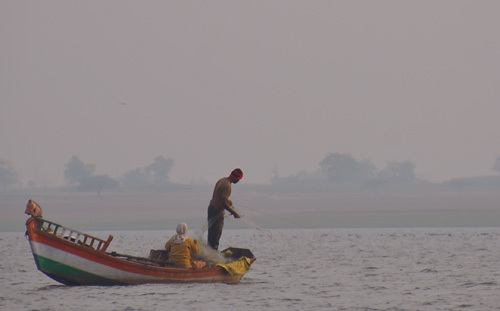 The boatman also throws dead fish in the water to attract gulls. The gulls don’t seem to mind our company and you can get to see them pretty close this way. I also tried my hand at rowing, but gave up after the boatman gave a slight hint that my car parked at the distance seemed to mysteriously keep shrinking by the minute. One advantage of going in early was that the light was just awesome if you managed to get your subjects in the right position. The way i classify birds are as follows: Big bird, small bird, colourful bird and very colourful bird. Of course, this is apart from the crow and the pigeon. 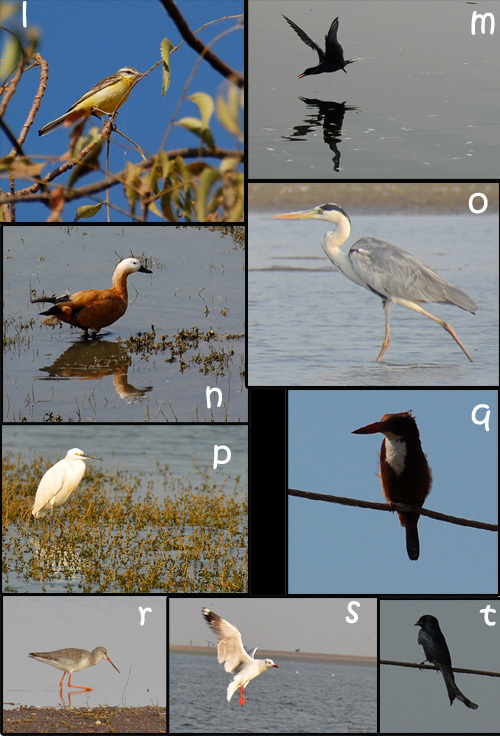 We saw lot of birds during our two trips and i put a collage of them below with letters against them. 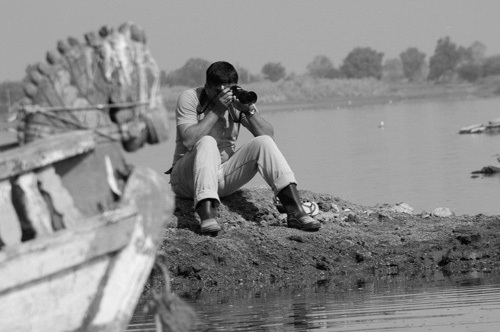 If you are one of the elite knowledgeable birder kind, please do name them in the comments section. The ones that i know. 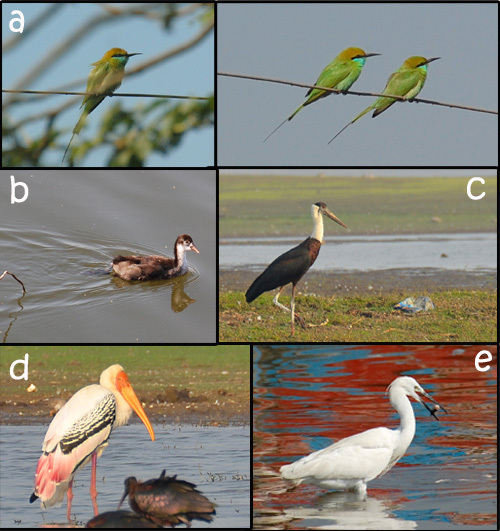 The first photo (also ‘d’): painted stork, j & n – Brahmini Duck, K – Pond Heron? , t – bee eater? You don’t have to get lost at Kumbhargaon finding help. Contact Sandeep Nagare (9960610615), a kumbhargaon resident. Any non-localite entering Kumbhargaon seems to ask for Sandeep 🙂 Call him up a day before and ask him to arrange boats for you. We found him (and his brother) to be extremely helpful and cooperative. He is knowledgeable too to help you go beyond “small bird” and “big bird”. After you finish the boating, you can have breakfast/lunch at his place. Very well written article, I visited this place after reading this blog post. And here are the bird names that I am familiar with. 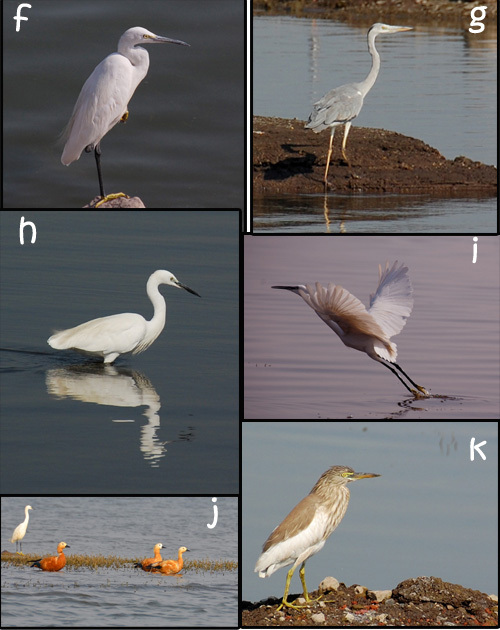 If you look at my Bhigwan album on my FB Page, you can see some of these birds in them, also the Bhandup Pumping station album, where I saw Green Bee Eater for the first time. Also some are at https://www.viewbug.com/member/elvisfurtado. R – definitely a sandpiper, but not sure which type. c is a wooly necked stork. Places near Pune and Mumbai © 2019. All Rights Reserved.